I can’t help but roll my eyes every time I see a video on Facebook showcasing some man’s over-the-top display of affection for his partner. Y’know the type I’m talking about – the expensive and elaborate Valentine’s Day dinners and the Tiffany-themed surprises. I mean, don’t get me wrong; I’m happy for those couples. But those epic displays of affection just set the bar way too high. People begin to build up grand expectations as to what a man’s love should look like. That means our genuine attempts at expressing affection often go unappreciated – or worse, unnoticed. 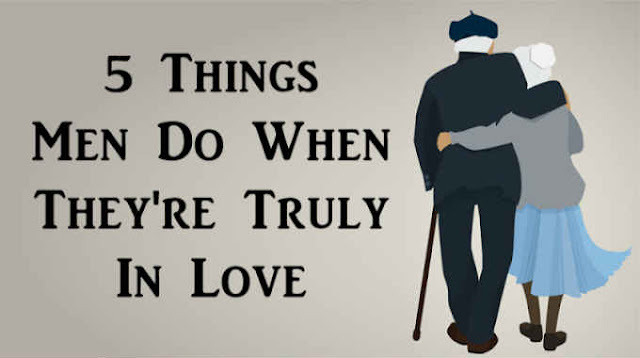 Here are 5 ways the average man lets his woman know he loves her. These things may not come with a hefty price tag or attract thousands of Facebook likes but hey – life’s about the simple things, right? This is the foundation for everything that follows. If a man does not respect the woman he’s with – if he sees her as little more than an object to fulfill his fantasies or make him feel wanted – he doesn’t love her. He may lust after her – but not love her. When a man truly adores his partner, they are equals in his eyes. He talks to her not as someone who should be following orders or bending to his will and values but as someone with valid ideas, viewpoints and feelings. But when a man truly loves a woman, that’s not even an option. He’s not going to just ‘play along’ on dates with the intention of getting in her pants. He’ll stand by his values, even if she tugs him in the opposite direction. Why? Because he knows the value of honesty in a relationship. He’s not going to mislead his partner, only to disappoint her down the road. Her loves her, so he’s honest and upfront. Fellow men, if you feel like you’ve got reason to be anything but honest and upfront with a serious partner, you’re probably in the wrong relationship. When a man’s in love, key things about his partner never escape his memory. He remembers what sort of coffee she likes and what her favorite song is. Of course, he remembers her birthday and their anniversary. Why wouldn’t he? Love is one of the most obsessive natural human behaviors. This is actually healthy – as long as the love is reciprocal, that is. Love can make even the sloppiest of guys attempt to get their act together. It’s not even so much that he wants to flatter his partner with a false impression. He just holds them in such high regard that he won’t subject them to anything but his best possible self. In other words, when a man is in love he genuinely wants to become a better person. He knows his partner deserves that much. By the time a man is ready to settle down in love, he will have had roughly six hookups. Seriously, people have studied this. Those 6 women will leave his life relatively quickly. Truth is, he probably didn’t fight very hard to keep them around. He probably didn’t think too deeply about making it through rough patches in those ‘relationships’ or working to fix his mistakes. The only woman a man will do things like that for is the one he loves. He knows true love is not easily replaceable. He knows that if he lets the love of his life walk away, he may never find a woman like her again. So he fights.